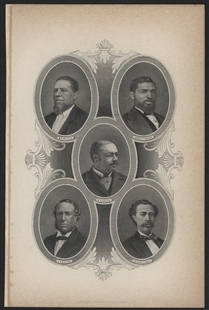 Portraits of five African Americans serving in Congress during Reconstruction - Joseph Rainey, John Lynch, James Rapier, Hiram Revels, and Blanche K. Bruce - were included in this engraved illustration from Speaker James Blaine’s two-volume publication Twenty Years of Congress from Lincoln to Garfield. 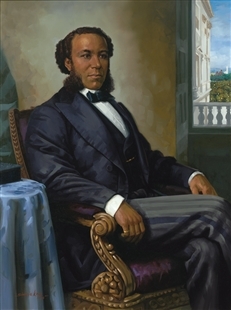 The book covered, in detail, the events leading up to the Civil War through the Garfield administration. 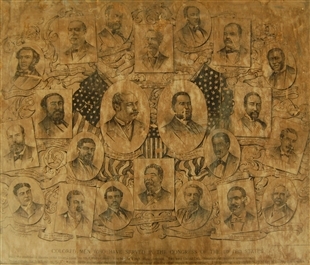 New York engraver William Wellstood engraved the prints included in both volumes, which provide likenesses of Speakers, Presidents, Vice Presidents, and other individuals of note discussed in the history.